Welcome to my new home!! Yay! It’s still work in progress, but I hope you’ll peek around at some of the fun updates! And you’ll never guess what I received today?? Are you ready??? 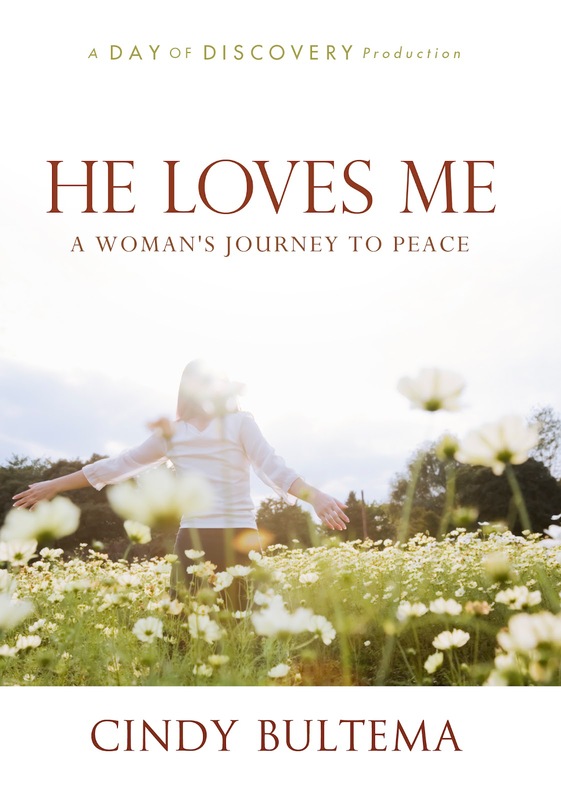 The finished Day of Discovery DVD of my personal testimony….now known as “He Loves Me – A Woman’s Journey to Peace featuring Cindy Bultema“. Can I get a Woo Hoo?! John is working late tonight so I just popped it in and watched it by myself. What a crazy mixture of emotions. I laughed. I cried. I over analyzed my every move. But mostly I just sat in awe of God’s grace and faithfulness and can hardly believe what He has done. Why would you like to win?? RULES: Starts today, Thursday, May 3rd and ends Sunday, May 6th at 9 PM. Winner will be posted on my new website during the week of May 7th. Thanks for stopping by *She Sparkles*. Have a wonderful, fearless, power-filled, day!! Beautiful new look!! Don’t you just love the fresh energy a new website gives you? Can’t wait to see your testimony. AWESOME! (and you know i am stingy with my capital letters!) looks great, cindy. I have been following you now for several months via Facebook & your blog site. Your stories/reflections are a breath of fresh air, in a world that seems to be so chaotic at times. 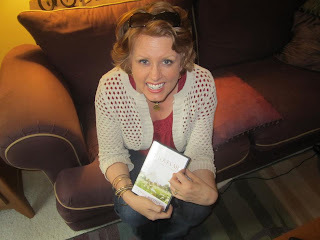 I would love to hear your testimony on your new DVD (how exciting!) and, in turn, share it with others in my life who seem to be searching for what life holds for them. Bless you for blessing so many others & standing in faith on God’s promises! I would love to win because your testimony is AMAZING! I have read and followed your blog for a couple of years and I to have been though so much! You are a inspiration and I would love to share this DVD with others! Thanks for the giveaway! Posted this giveaway to my FB wall! I am so, so excited for you! New site, dvd in hand, can’t WAIT to see it!! <3 u! I had the privilege of hearing you’re testimony at our Ladies Retreat (Chapel Pointe- Shipshewanna) in the fall. It was so encouraging and life changing for me, and so many others! If I were to win I would share your message to encourage many others! I have recently been encouraging an unsaved friend to seek Christ. She (and her family) have been attending church with us! Even her husband is receptive to the messages our pastor is presenting each week. She is just one example of the people I would love to hear what you have to share! Cindy- I would love a copy to use to spread your story here in PA! Also to be honest and fully transparent I sometimes just need to see your face – I miss you 🙂 great job by the way. It is amazing and captures your authentic and lovely self- it sparkles! I would love to win a copy of this beautiful testimony of a lovely lady who serves an awesome God. I liked your fb page and shared a link to your site on my Facebook page. I’m so excited for all of this! Wow, Cindy! So exciting! I am really eager to view your new video. You are such an inspiration. I loved the preview – would love the whole story. God is good, all the time! Cindy, I am so excited. There is nothing I would like more than to have your story on tape to share with the small churches our ministry reaches out to. We are currently developing worship teams and teaching worship in a Baptist Church in Harlan, Iowa and continuing to assist at an annual Bible Conference. I have given your name to the leadership teams of several places and will continue to prayerfully encourage them to contact you. God bless you! Take plenty of time to enjoy Jake’s graduation …coming from a mom who’s kids are now past that point. Oh Creative, Courageous, Compassionate Cindy, I am so PROUD of you (for all the right reasons) and what God has done and will continue to do in your precious life that you’ve fully handed over to the One and Only. He LOVES you SO MUCH as do I.
I wouldn’t want to take someone else’s place on receiving this amazing series but I would use it well with others as I travel around country and I’m always looking for great material to share with others who are on the front lines doing ministry. CONGRATULATIONS my Sparkly Friend. commentcommentcommentcommentcommentcommentcommentcommentcommentcommentcommentcommentcommentcommentcommentcommentcommentcommentcommentcommentcommentcommentcommentcomment (for real this time! I want to WIN because I love you!!!!!!!) PS I also want to buy a copy to send to my mom and sis in Florida. I love your new site! In fact, I remember (over guac and chips) you talking about getting a new site. Hooray! And I already liked your new FB page. You are really hard not to like, btw! And just shared it on my s(He) Listens site!! 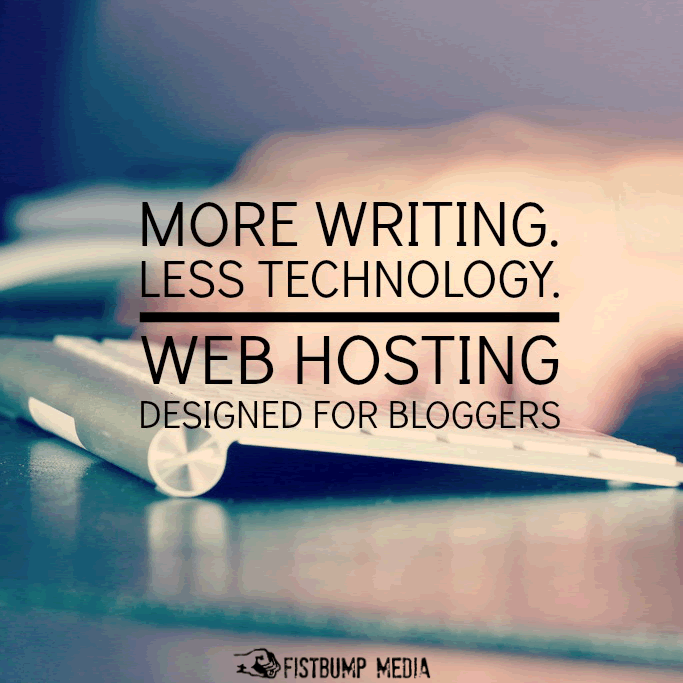 Love your new website/blog! Would love to win a copy of your DVD! I can’t wait to see it. Girl, God is doing wonderful things in your life! Love that you are sharing HIS story through YOUR story in such a BIG way! 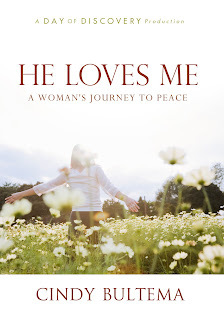 I would love to win your DVD because we work with boys that are struggling in life daily but through those boys I am connected to several hurting moms that need to know about that PERFECT PEACE that HE has to offer. You are such an inspiration and I’m so thankful that our paths crossed at Speak UP….you were an encouragement to me! Congratulations, Cindy! Well done. May God bless and use this for His glory. You amaze me and fill me with hope. Can’t wait to see the DVD!!! This would be a super blessing. I feel all the women in my ministry would be able to benifit from this is such a blessed way that it would just be AMAZING and in that people will see how gig God can be, and its not even a tiny fragment of just how big He can get how amazingis that in iitself… Now that gives me Holy Goose bumps saying that and thinking aboubt it. I would love to win because I can not get your program where I live! I have looked and it is not available 🙁 Loved watching the promo! Very excited about your new DVD. Would love to win it so I could see it in full and then see who God brings to mind to share it with. Love the new site!! Looks great! Woo-hoo! This is awesome, amazing, wonderful and clearly the work of God. I’m so proud of you and so thrilled for you. You go girl! Why do I want to win? Why not? I would love to share in your exciting journey with you. Love the website especially the She Sparkles verse with your family in the background. Woo hoo to you! Love the new website!! I would love to win this giveaway for a friend of mine who recently lost her hubbie of 3 months to a drunk driver. To have some one “get it” would be incredible for her heart. She doesn’t know the Lord YET, so winning this DVD would serve two purposes: 1.) To help me be bold and kind with witnessing to her, and 2.) To help her see God can create beautiful out of ashes. Congrats Cindy! I can’t wait to see the fruit from all of this preparation! I would like to win a copy of your DVD for two reasons: 1) I have a friend who also lost her fiance to death. She is still struggling 3 years later. She’s not a “church goer” but I have talked about you & I believe she would watch it. 2) After that, I would like to donate it to Sunshine Community Church’s media room. Why would I like to win? Because you, your story, and your life have encouraged me more than I can say. I am so thankful to the Lord for leading me to your blog and even making it possible for me us to meet in person! God is so good! 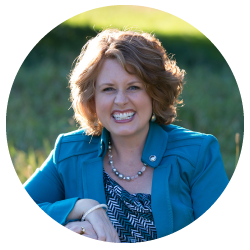 Love you, Jenny C. Your new blog is just beautiful! Congratulations! Your story is so interesting and real and compelling. I would love to see the whole story! giving a resounding WA-HOO!!!!! Oh I’m soooo excited. I want a copy sooooo bad. I cannot wait to see it. Praising God with you my friend. He is truly so good. I admire you for pushing through all the warfare to get to that finished product! It is worth it. Love you my friend! When you spoke last year at West Park Baptist in Knoxville, I was touched by your story, as I know the others in my ABF were. Thank you for sharing your heart, daily! I would like a copy because my son is an alcoholic and drug addict. He needs help. Cindy, You don’t know me personally, but know we are sisters in the Lord! Hello. I would be tickled pink to win this meaningful give away. I’d like to watch it first hand and then pass it on to a daughter-in-law that does not personally know the Lord and share it with her mom as well. 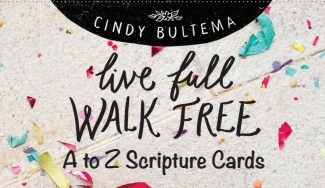 Hey Cindy–I would love to win your DVD and hear your story. My friend Erin Leyen posted your link on facebook and it was so fun to see my old friend John. I lived in Swallow Robin with John and Tim and they called me little sister. I am so excited to see how God brought you and John together. I LOVE all the red hair–my husband is a red head and so our my boys! So excited for your Cindy! I can’t wait to see this! and would LOVE to own a copy!!! LOVE the new site too!!! Wow Cindy! Love the new look! Congratulations! I would be tremendously blessed and honored to win your DVD sharing your personal testimony as a child of God, a woman, a mother, and a wife. All women need encouragement from one another and through sharing we are better equipped to see God’s hand and blessings in our own lives. Congratulations and Thank You for your transparency in providing the details of your testimony and sharing the blessings of the gift of you and our Lord and Savior!